-Classroom with a small closet at each side adjacent to the choir. -Cloak room and toilet at each side adjacent to the entrance vestibule. -Stairs lead down to lower floor. -Perfectly symmetrical plan on vertical axis. This is an example of a redrawn floor plan, based on original drawings, that I will be including in this book for as many of the significant buildings as I am able to find. As with all other images on this site, do not use this drawing without permission. 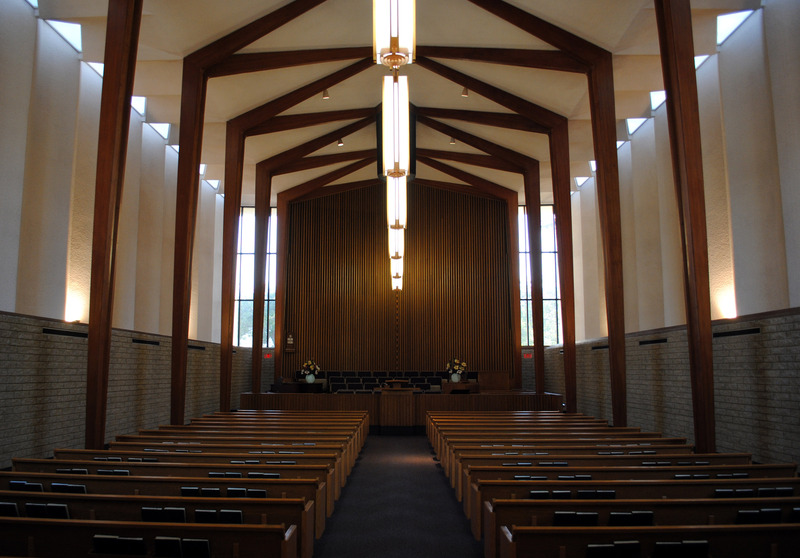 Fantastic modern chapel designed for the Brooklyn Branch by architects Pope and Burton. Dedicated Feb 16, 1919 in three sessions by Apostle Reed Smoot. I was quite surprised by the interior of this building, especially the radial layout placed inside a rectangular exterior. What it provides is a nice space for support rooms behind the rostrum. 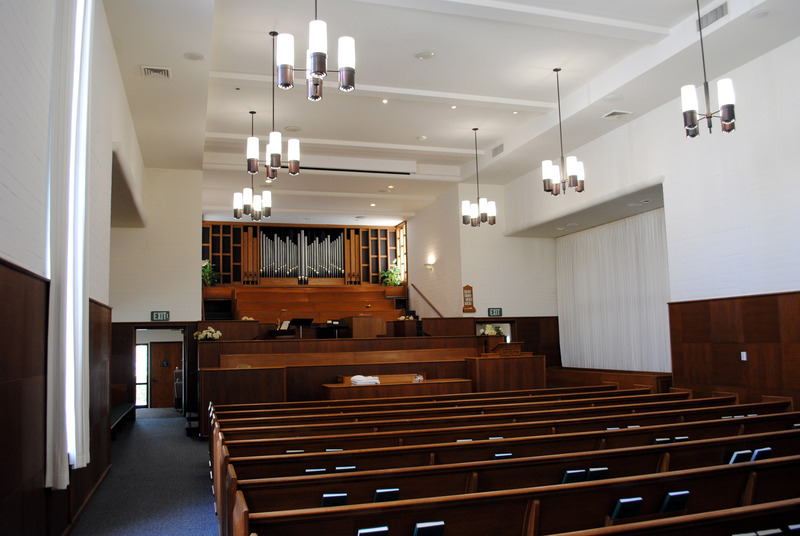 All of the pews, pulpit, and even choir seats appear to be intact from the original design. It was difficult to get a shot of this building with all the trees at the sidewalk and with a tall security fence surrounding the building. 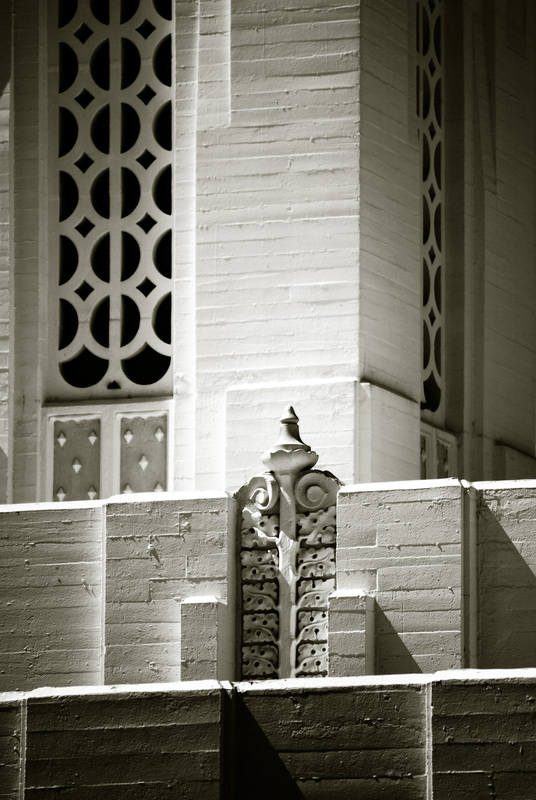 This photo is of the chapel, taken from the sidewalk in front of the building. The Cultural Hall is unconnected and to the right of this photo. Access between the two is through an internal courtyard. 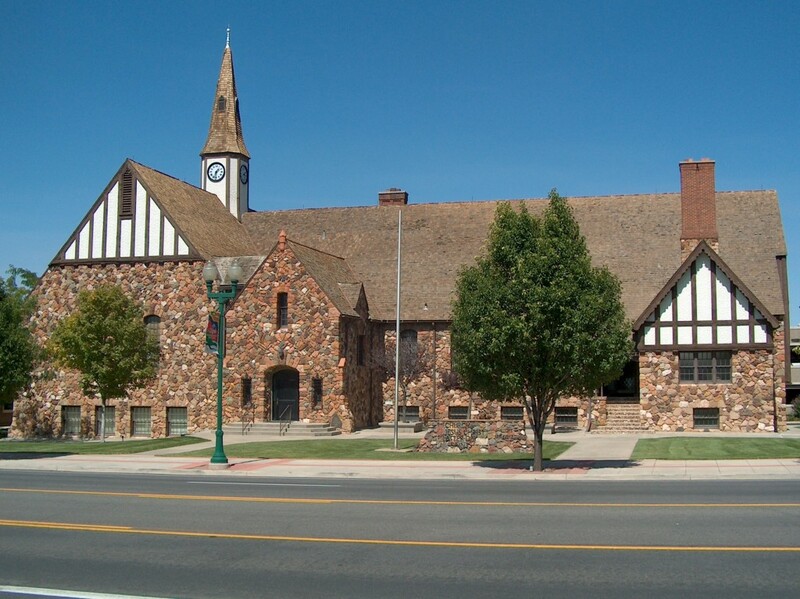 I was excited to find out today that the Cedar City 1st Ward building, or historic Rock Church, will be Rededicated this Sunday after closing last year for renovations. The dedication will be at 6pm and the building will be open for tours both before and after from 5pm-8pm. I have not been to visit the building yet, but from what I understand, the Cultural Hall has been restored to its original design, including removal of carpet for the original hardwood floors and removal of the wall panels that covered the windows. The radiators were left for historical reasons, even though the building now has central heating and cooling. The original pews have been restored and the font and mural still remain even though it is no longer functional. This building was built when the original Tabernacle on Center and Main was sold to the Government to be demolished for a new Post Office, but the still-working clock from the Tabernacle can be seen in the steeple. I was blown away by just about every detail of this meetinghouse. Definitely one of my favorite mid-century buildings. Originally organized as the Florence Ward in 1923, the ward name was changed to Matthews in 1924 after a $15,000 donation towards a building by ward member George Leon Matthews. A convert from the RLDS Church, George was 86 years old in 1926. The ward members suggested and voted for the ward name to be changed in his honor. Because of the donation, construction began immediately. Dedicated the following year, the entire building would cost about $22,000. In 1926, George and his wife also donated an Estey organ to the building. On Feb 2, 1941 ground breaking took place for a new chapel to be built to the west of the original chapel. The new building was dedicated on Feb 7, 1943 by Charles A Callis of the Twelve. By 1962, the Ward was made the official Indian Branch Headquarters for the area and by Feb 1963, the Matthews Ward would be discontinued and combined with another ward. 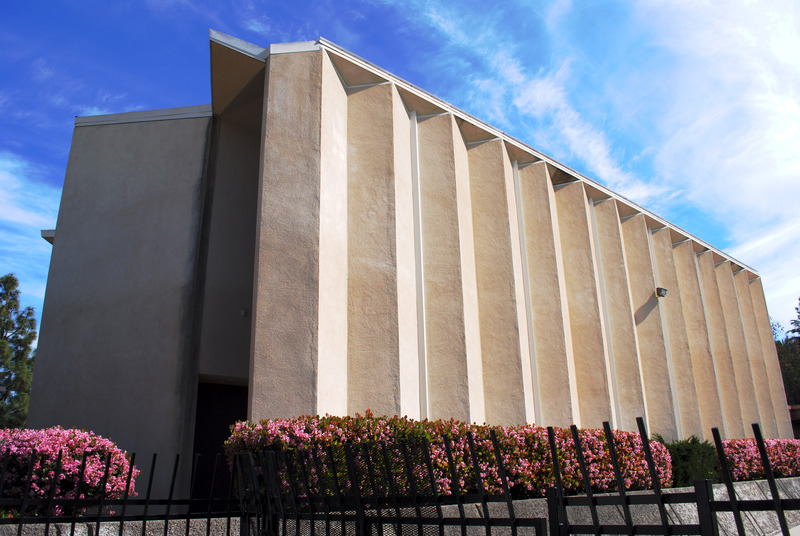 The building has since been sold and is now being used by the New Morning Star Baptist Church. 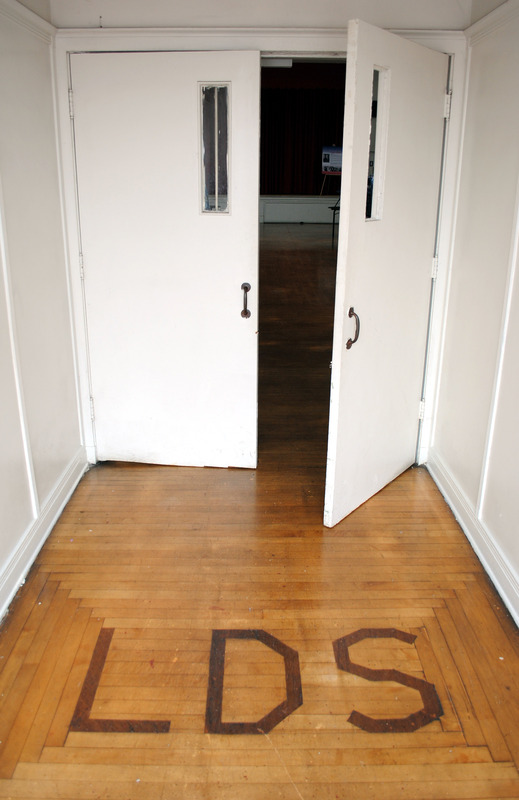 The letters ‘LDS’ still remain in the entry lobby off of the busy street which functions as the main entry into the building. Beyond the doors is the Cultural Hall. 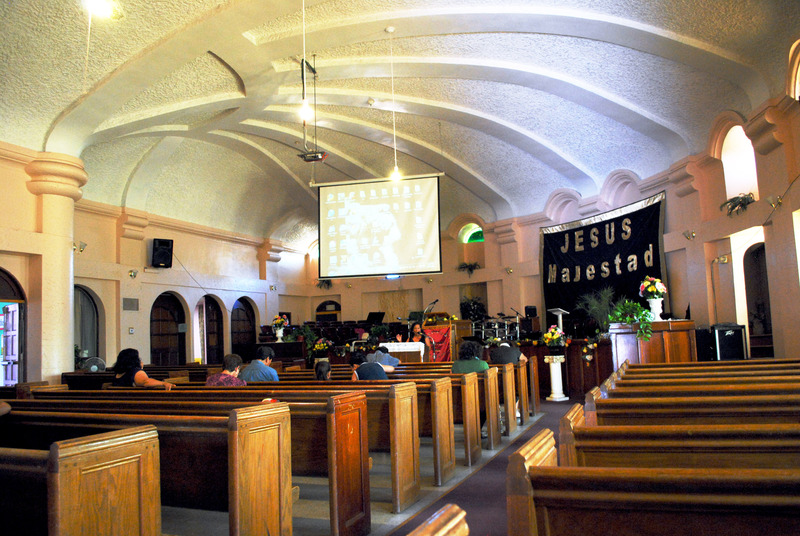 Also known as the Westwood Ward Chapel. 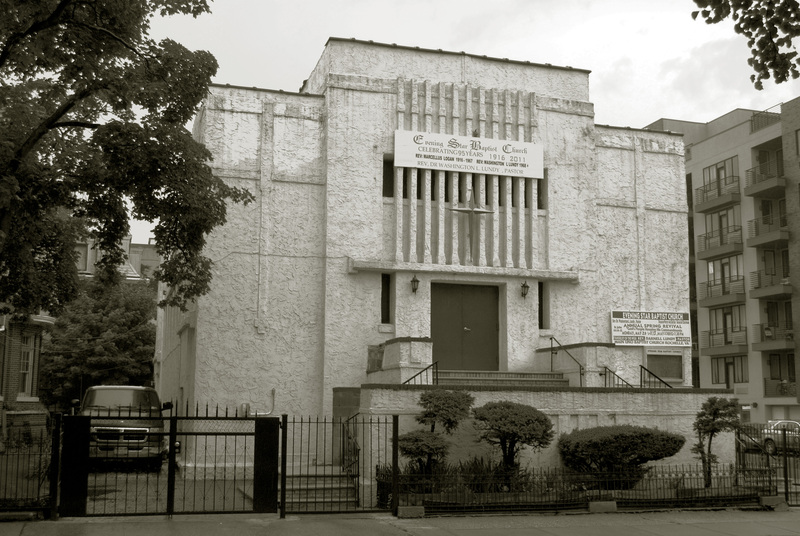 This building has a similar, but not as grand entry as the Las Vegas 9th Ward Chapel, also designed by Harold Burton. I believe this building is now called the Westwood Ward, but originally was the Beverly Hills Ward. 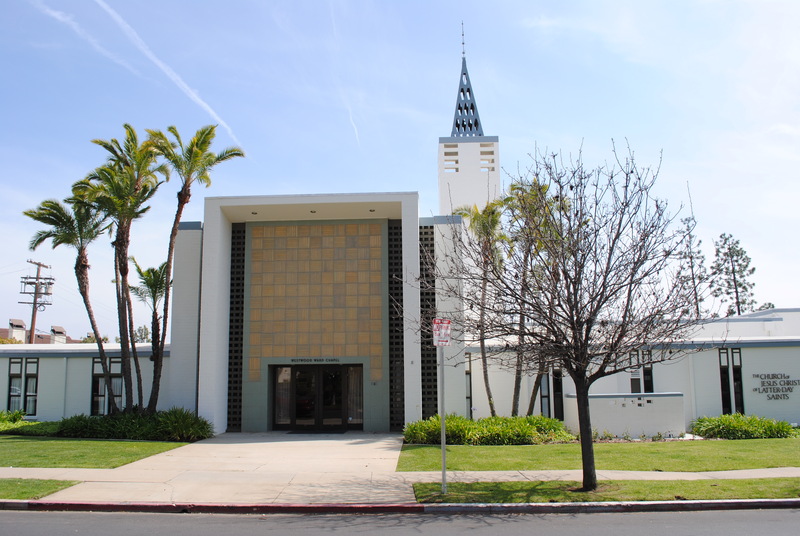 Built several years prior to the Los Angeles Temple, this Chapel is located several blocks behind it. I love how the Sacrament table is not only centered in the room, but also brought forward as the closest element to the pews. The pulpit is pushed to the side as is the clerk table. This arrangement shows the importance of the sacrament over that of the spoken word.